Alexis is one month old! Weekend recap and is it bedtime yet? We (like most areas) have had a very mild winter. In addition to the mild winter we've finally been getting rain. Something we haven't seen much of in the past year. Today it was drizzling this morning and got up to 80 by this afternoon. This also means it's brought lots of humidity. Our little group ex room and gym a/c aren't doing a great job keeping up with it. 35 minutes into the 8:30 combat class the mirrors were fogging up and the floor was getting slippery. It was a full class too with over 30 people which seems even more crowed now that there are new bikes so they take up floor space. We had a fill-in instructor from another Y in town. I've had him once before and he's kinda crazy. Last time he had camo paint on his face. This time a painted on black eye mask. This time however in addition to his compression top, he wore compression bottoms. So not a look anyone can really pull off well, especially in a family gym. It seriously looked like he just forgot to put his shorts on over his boxers if you didn't know better. I could have done without that. Didn't you always want to know that information? Ha! I love 8:30 group ex classes because it means I'm home by 9:45 and have most of the day ahead of us. I'm seriously really disappointed the schedule is changing next week because I love the one we have now. All my classes are changing times starting next Monday. Boo! 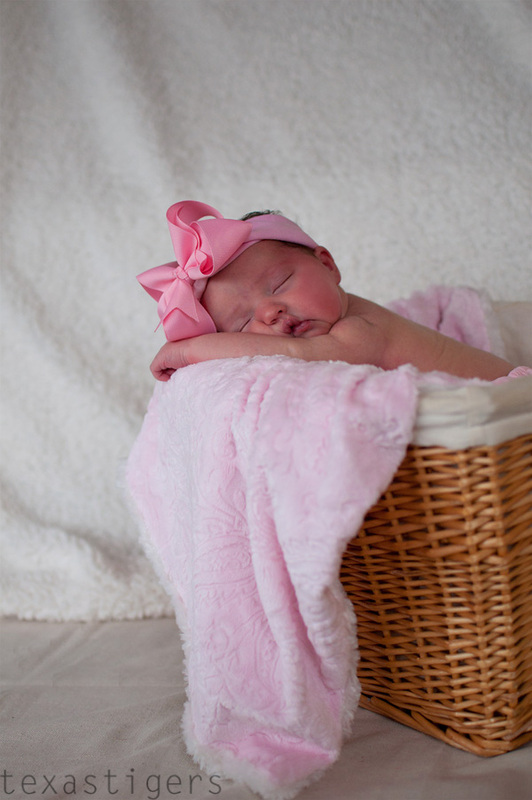 As I folded laundry sweet Miss Lexie laid in the moses basket and 'talked' to me - cooing and smiling away. Look how big she is getting. I just about caught a smile. This is the end of it. If you look closely, you can almost see her dimple on her right cheek. I need to figure out what is going with my camera. I think I messed with a setting or something and it's metering light strangely. Some pictures are over-exposed (too light) and others under-exposed (too dark) all when taken one in the same spot/time. It's annoying me. We played outside in that late afternoon. We would have gone out earlier but while I fed Alexis the kids took out a bunch of toys and played on the large landing on the stairs. Then they didn't want to clean them up. If the toys had been in the playroom I probably wouldn't have minded - yes we need to work on picking up but in the playroom I don't mind as much. The stairs I do mind because I don't want anyone tripping and falling. It actually felt really nice outside... which can only mean it's going to be very hot here soon! I'm both looking forward to and dreading the summer. I know it's going to be hot and miserable but also love the pool and splash park and all the summer activities to do! We had a pretty low key weekend. I've been cleared to head back to the gym so I've made it there 4 times in the 6 days since Alexis hit 6 weeks so we all headed to the gym after a nice family breakfast on Saturday. 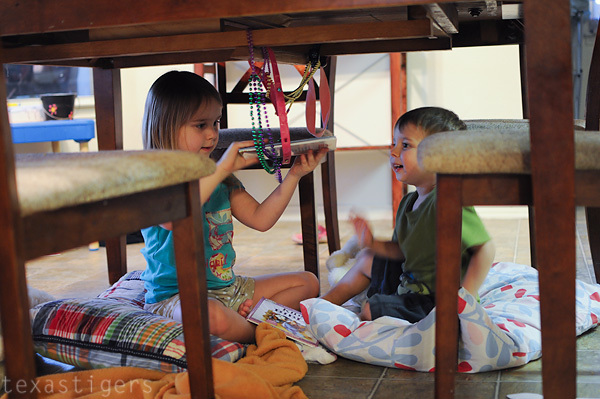 Between the gym and heading to Bible class the kids played with Mardi Gras beads and made a 'home' under the kitchen table. 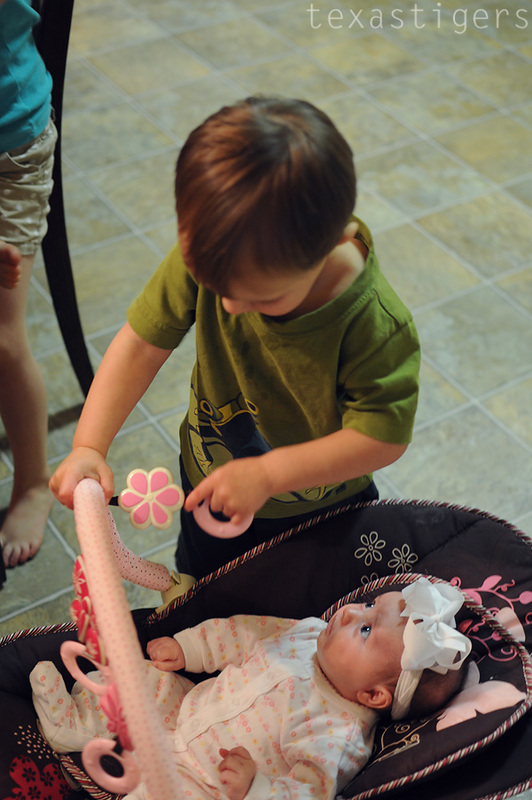 Micah was a sweet big brother talking to sister while I got dinner together. Sunday morning we headed to Church. It was a great service (as usual!) but an extra special treat as Mac Powell of Third Day lead the worship. After we got home we spent the rest of the day relaxing, playing and cleaning. I did a little cleaning downstairs and the kids did a lot of playing upstairs. They played nicely together from about 1pm after lunch until dinner time. Seriously. Lexie and I sat in the playroom and played with them for the first hour or so until she gave me a serious milk bath that required outfit changes on both our parts. After she fell asleep for a nap I cleaned up downstairs, folded laundry (it's never-ending!) After dinner we spent some time trying to clean up but the kids weren't interested but we did get it picked up enough to walk in the hallways. So why is it that when it comes to picking up toys it's like pulling teeth.... but when I was cleaning my bathroom today they were all wanting to help? Abby gladly volunteered to wipe the baseboards and whatever else she could do. Our house must have some weird wiring because our lights are constantly burning out. Many fixtures have multiple bulbs so I usually put off changing them until lots are out. Well it finally got to that point last week. I changed 8 bulbs last week - Abby's room and closet, the hallway, the laundry room and pantry. When we went to Target today I picked up another 8 bulbs and put all those in fixtures that still needed them. I could have used 2 more lightbulbs on top of the 16 I changed. Crazy I tell you. It's much brighter in the house now. That also means I'm seeing more of the dust and dirt I need to clean. ... hmm maybe I'll take out a few of those bulbs then and pretend the dust isn't there? Some days bedtime is very challenging as Alexis sometimes decides that's time to cluster feed which makes dressing Micah, brushing teeth and reading books a little more challenging one handed. Tonight though things went smoothly. Starting with a nice bath. I gave the kids their bath and I even got in with Lexie so she could really enjoy the water and she was such a content girl. 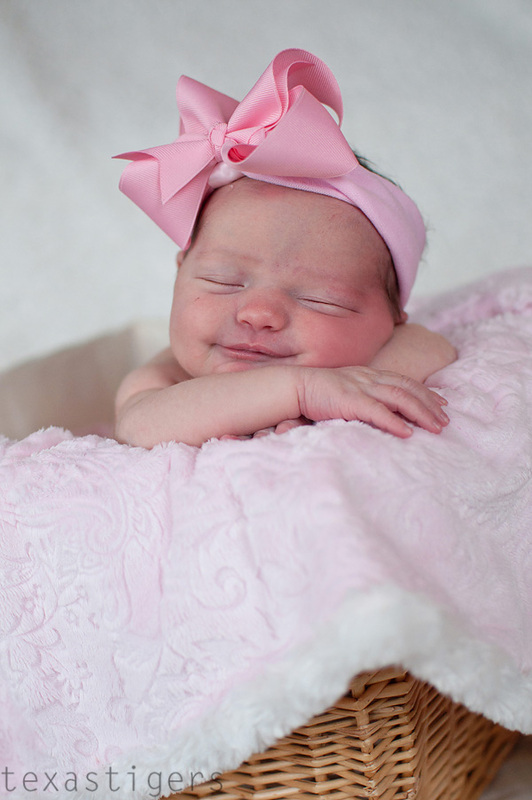 She loves her bath time - smiles and so calm and relaxed. After everyone was in jammies we sat in Abby's room, read her school books and let Alexis get some pre-bedtime wiggles out. Abby wanted me to take a picture of their feet. 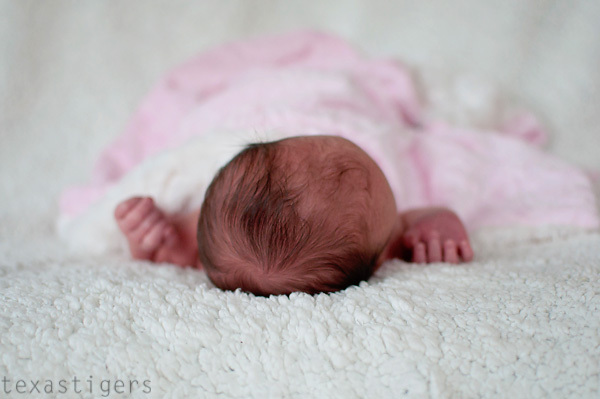 Aren't Lexie's tiny baby feet so sweet? Micah couldn't resist giving Alexis some love. 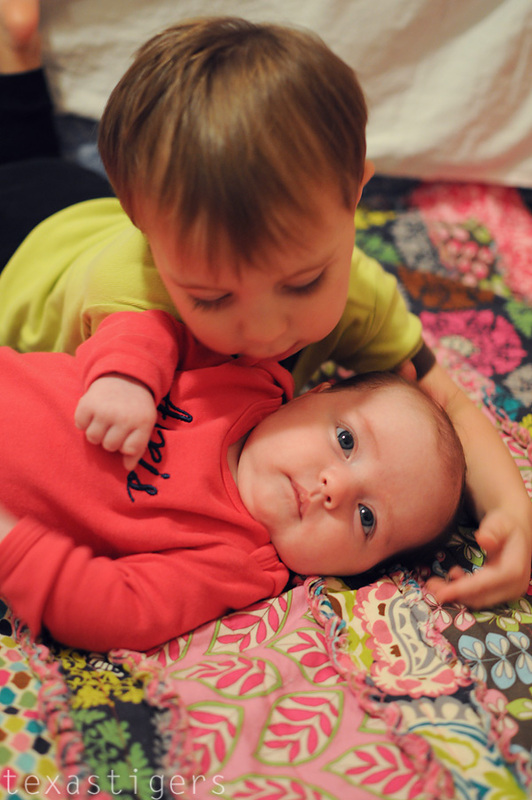 He loves his little sister. Both of them really love her. Abby will sit next to her if I leave the room and tell me if she is still sleeping, awake or fussing. She'll talk to her and gets some big smiles out of her. Micah isn't quite as gentle (what do you expect from an almost 3 year old?) but he really loves her. If she is crying he'll say "it okay baby lexus" He can't/doesn't say Alexis... instead calls her "Lexus." 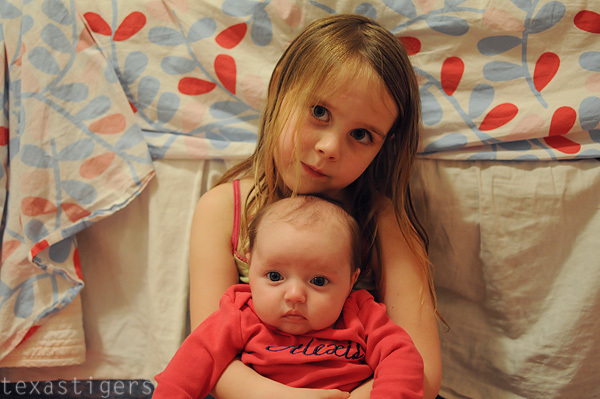 They both have to give her good night hugs and kisses before bed. Hope ya'll had a good Monday! 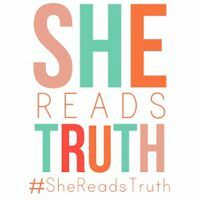 Eventually I'll fit in more blogging time so my posts won't be such random ramblings catching up on all the weekly details so I can remember these days as they go by so fast! I mean look how big my once tiny baby looks already! 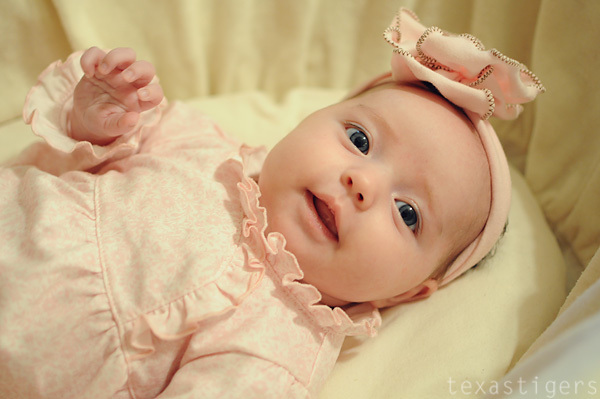 When I was taking Alexis's one month pictures she got a little hungry so we took a break before finishing up and Abby took over on the camera. She had a lot of fun using my big camera and got very snap happy taking LOTS of pictures. She mostly used Micah and some toys as subjects but she did take a few of Alexis and I.
Micah - as taken by Abby. 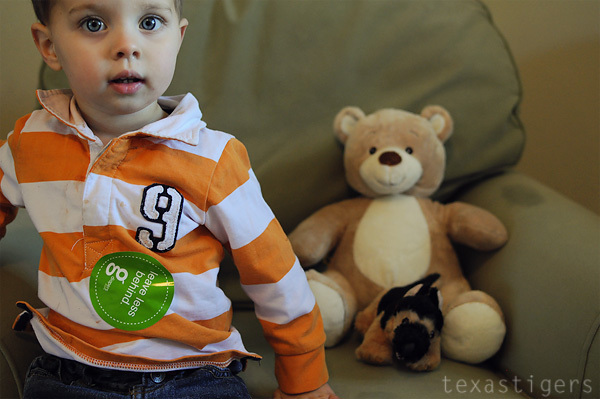 He found this sticker and had to have it on his shirt since I had a sticker on Alexis's onesie. Ha! This sweet girl is starting to like her swing... which is good because she didn't really want to nap in her crib the past couple days. It gave me a few minutes to do some cleaning and tonight it gave me free hands to cook dinner instead of having her in the wrap while I cooked. 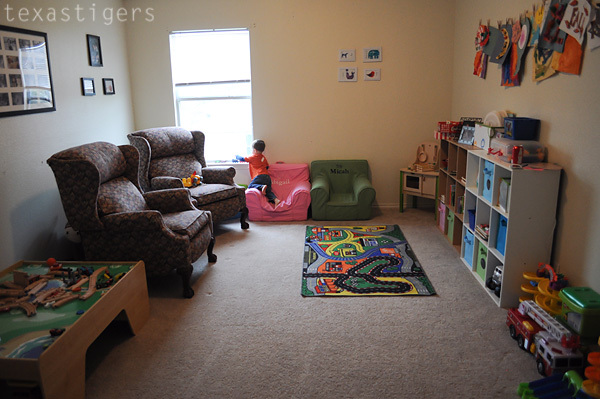 Last week I cleaned the playroom and re-arranged a little bit. I felt I needed to take some photographic proof it was clean because it never lasts long! Micah is a busy boy and feels the need to dump the cars and animals every time they are put away. 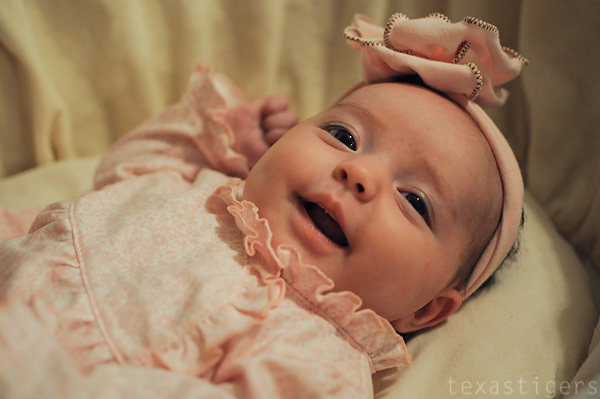 Alexis had been pretty shy about her smiles up until this weekend. She'd smile but you had to work for them and definitely not for the camera. Today she has been especially smiley and I managed to catch one on the iphone camera. I also decided to give up cokes for Lent. I don't usually give something up, it's not something our Church does really. It's just good timing because I'm way too addicted and want to kick start some serious baby weight losing so without cokes and with being back and the gym I'm hopefully that I can be back at a size I want by spring. I've got money I saved from Christmas for post-baby spring/summer clothes and I want to look good in them. I also want to look good in an Easter dress and for Mother's Day since we do family pictures on Mother's Day. I'm doing better on day 1 without coke than I usually am so hopefully I'll be able to not cave! Also I now have a few extra minutes in my day now that I have a dishwasher again! Funny how when you get older you get excited about household appliances! It took long enough to get it but I'm oh so happy to have a functioning dishwasher again! This weekend my mom has been in town and Abby and Micah have been in heaven having Gigi here. They could not wait for her to get here on Saturday and were watching out the window half the day even when I told them she wasn't close yet. It was a long weekend because Abby didn't have school today for President's Day (unfortunately we don't get off the whole week for Mardi Gras like Louisiana schools do!) 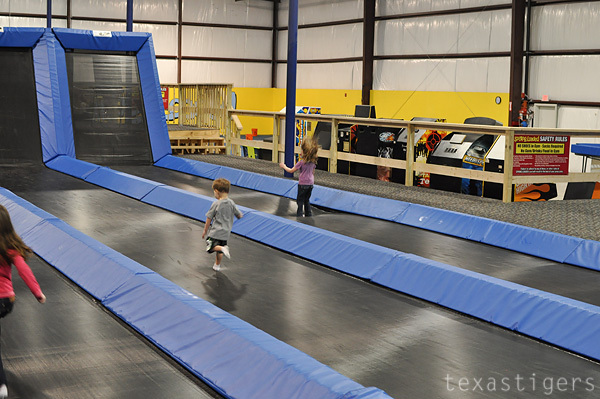 So Monday since she was out of school we headed up towards Austin to San Marcos and took the kids to play at Spring Loaded Trampoline park. 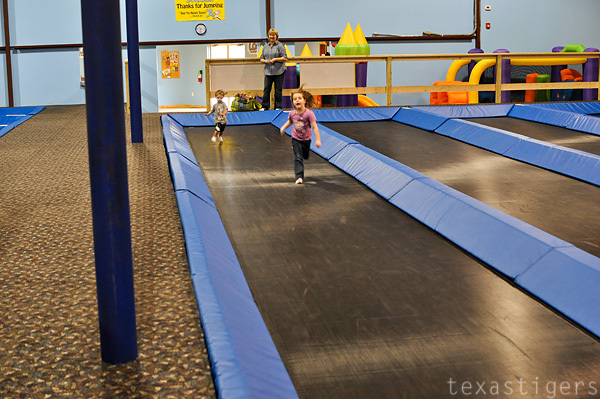 I'd never heard of anything like it before but it was so fun for the kids! 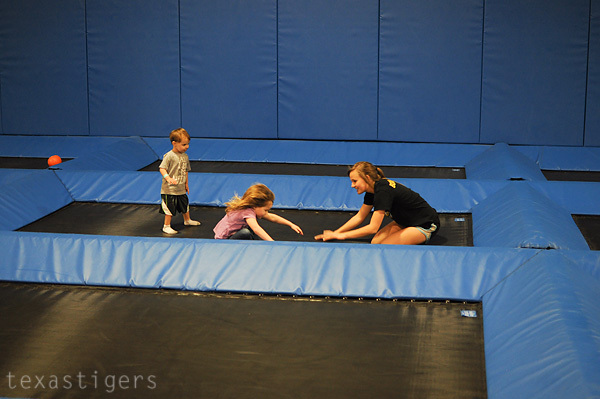 They bounced and jumped for two hours! 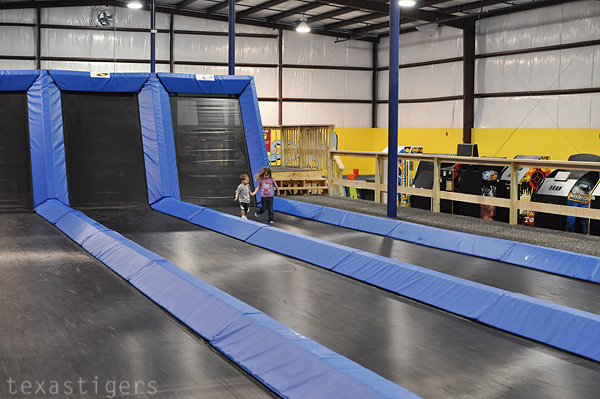 They had these long 'runways' to run/jump/tumble down. 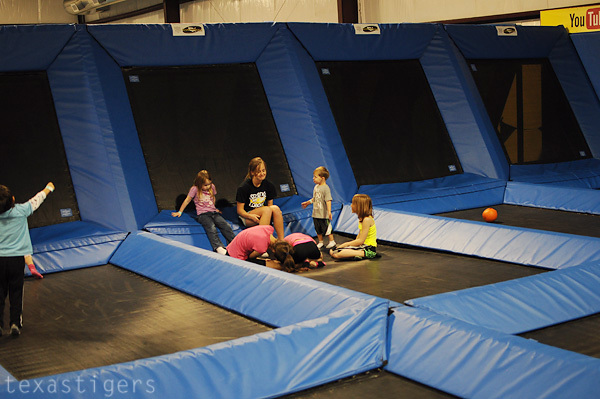 While the kids played in this section they found a girl who was working there (maybe the daughter of the owner since she wasn't that old - but she had an official 'bounce leader' shirt on) Abby and Micah became good friends with her! She tried to teach Abby some summersault tricks (where she would summersault and bounce back up) but Abby and definitely Micah aren't really heavy enough to get a whole lot of bounce from the springs. She had some other friends there and Micah made them all his girlfriends ha! After two hours of bouncing we went and got some lunch, then headed to the outlet mall to shop... and shop we did... until we dropped. The kids are all now pretty much fully outfitted for spring/summer (Thanks so much Gigi and Pops!) All we need is new water shoes for growing feet! Then it was home where we all collapsed we were tired from our busy day! It was so nice to have my mom here for the weekend and I know the kids loved it too! 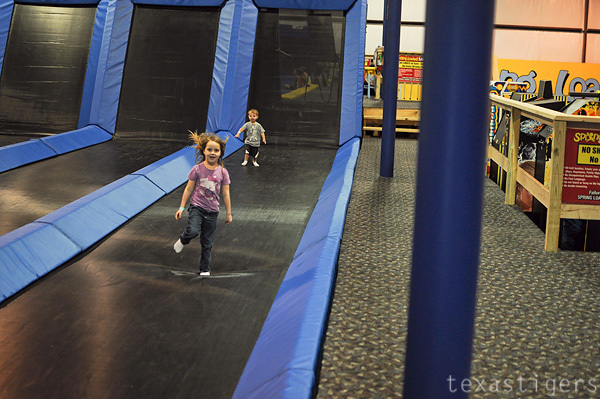 Abby has already asked if we can go back to the bounce place again. We had made Valentines for their friends over the weekend. I showed Abby all the options I had pinned on pinterest and she picked the fish one... but she was insistent that she didn't want the goldfish and wanted candy to give to her friends instead. So we settled on swedish fish. Abby and Micah had fun putting together the bags - they were helpful in counting out fish for each bag. 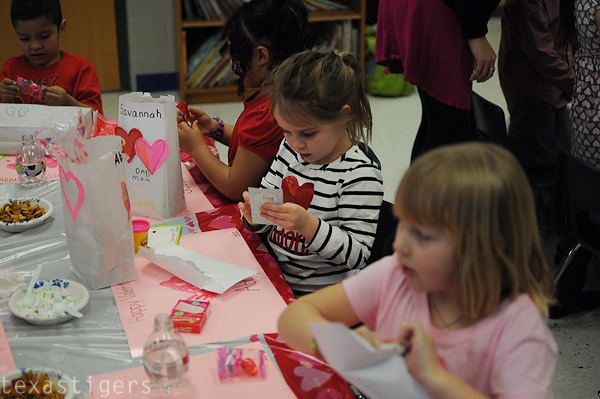 Abby even wrote out the names on all her friends Valentines cards. Once they got bored of putting swedish fish in bags, they wanted to make cards for some family and they started those.... but we still need to finish them up and get them in the mail... just a little late! We had a very busy Valentines day.... to start the morning Micah, Alexis and I headed to Church to work in the nursery during the Ladies Bible studies (like any other Tuesday morning.) 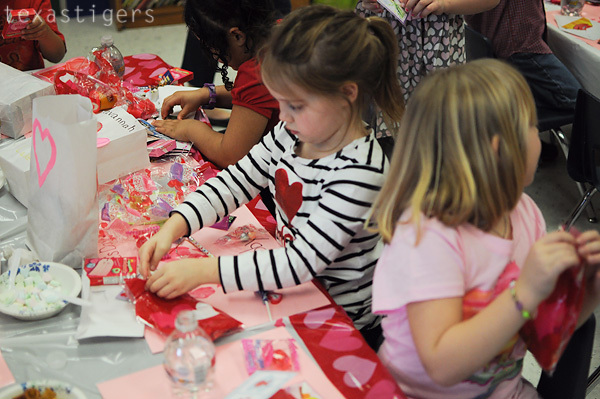 All the kids Bible classes had a Valentines party so he brought his Valentines to pass out to his friends and got to have a little party in his class. He didn't get to stay for his whole party though because I picked him up early so I could drop him off at home, pick up the bananas for Abby's class party and get to her school. Alexis and I helped with her party - fixing banana splits (hence the bananas) for everyone. All her friends were very interested in Miss Alexis. They were also very excited about their ice cream. 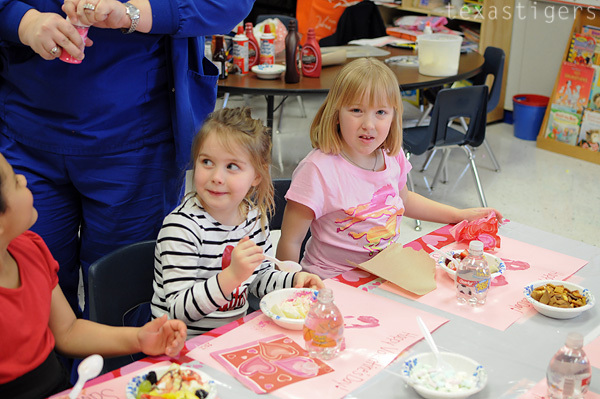 The only thing better than ice cream was that they finally got to open their Valentines - they were all so ready to open their bags and see all the Valentines they got from their friends. I got two not really Valentine presents but made me happy 'presents' - with the repair guy coming to look at our dishwasher (again) and telling us he'd be back with a new one (said it would be today but now it won't be until Monday....) and I got the part to my steam cleaner that I needed so I could clean the carpets. Once Beau got up in the evening (after working over night) we gave the kids their Valentines. Abby got a new shirt for her Build-a-bear puppy and Micah opened a joint present of Lady and the Tramp (he had gotten a little puppy at build-a-bear when we built Alexis her bear so he just got his present early) They also got coloring books from Gigi and Pops. I hadn't checked the mail yet that day but they also got a set of books and DVDs of Bible stories from Grandma and Grandpa. Beau and I decided to postpone celebrating with each other until he wasn't so tired and wasn't having to go in to work that night so we ended up celebrating last night with a yummy dinner after the kids were asleep. 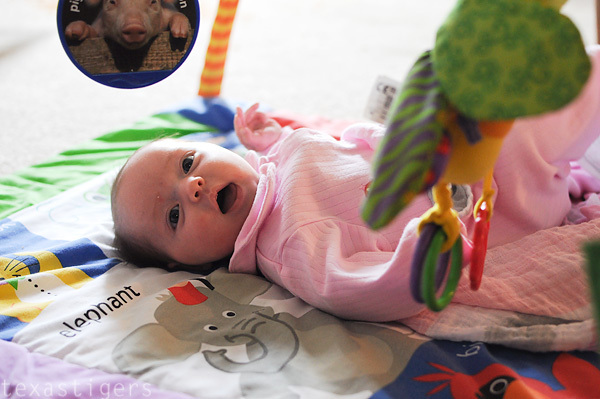 Miss Alexis is starting to really wake up and enjoy time spent wiggling on her playmat and in her bouncy seat. This afternoon she's been awake from about 12:30 until 8:30 pm with just cat naps here and there... very different from her normal sleeping habits so far. It's showing too with her being a little fussy this evening since she's so tired! I got the biggest smile from her at about 4:30 this morning. Ha! Not exactly the time I'm looking for smiles but it does make me smile during those middle of the night feedings. I've ben in spring cleaning mode around here lately.. sure it's not spring yet but it feels like it and I know I need to take advantage while Lexie is giving me lots of sleeping periods. I used my carpet cleaner and did the whole downstairs and the stairs yesterday. I feel much better with clean carpets now. Of course because I was working downstairs that means upstairs is destroyed with toys everywhere! I've given up on Micah napping most days as it makes bedtime a million times harder since he's not tired enough at bedtime with a nap. It makes 5 pm-6pm very hard though. However today I went to the grocery store and he stayed home with Daddy. He got a small boo-boo and cuddled with Beau to make it feel better.... and fell asleep at noon... and slept for 3 hours. Which means he's currently joining Lexie in not sleeping. I'm ready for him to go to bed (it's almost 9pm but he went to the gym with Beau from 7-8pm since I knew he wasn't ready for bed) so I can join Beau downstairs in a postponed at home Valentines cheese fondue and steaks. Yum and I'm starving! I fed Alexis and we got ready for Church. It was freezing out this morning and when we got to Church it was sleeting as we walked inside. I'd like to say I'm super happy we made it on time since it was just me getting us ready and out the door! I'd probably be more thrilled if that meant I made it to the sanctuary on time. 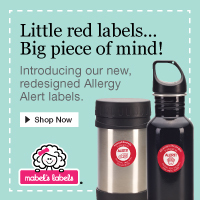 Two weeks ago we had issues printing Micah's tags (the system had his birthday wrong) and this week it put Abby in the wrong class so that meant we had to spend a few minutes getting the stickers fixed but it all worked out. Alexis and I sat in the cry room - which was good because she nursed through about half the service. Once at home we changed out of Church clothes, had lunch then the busyness began. ...did two loads of laundry during all this. Then we ran out to Joanns fabric because I decided last minute to make Alexis a valentine shirt. I already had a blank shirt for her but not for Abby or Micah and Abby already knows what she wants to wear so I didn't make shirts for them... though now I'm sad about that. The kids were behaving so well I stopped and rented them a movie at Redbox... but they had to pick up some of the toys they took out this morning before watching it. Once back at home I stuck the fabric in the wash.
.... popped popcorn for a snack. Tired yet? I am! Not sure where I got all the energy to accomplish all that today! At least we are starting out the week in a pretty good spot... well we've got clean clothes and towels anyway! I'd like to say now that we are in a good place I'd get it done tomorrow but we have MOPS tomorrow morning and Bible class on Tuesday so by Wednesday it will be time to repeat the above... being out all morning usually wears us out so not a whole lot gets done those afternoons. 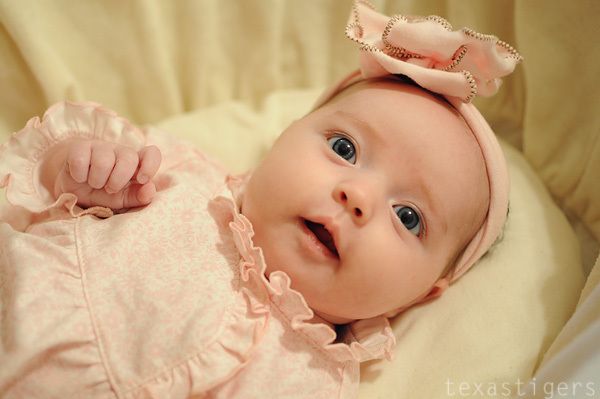 It's hard to believe this sweet little thing is already one month old! 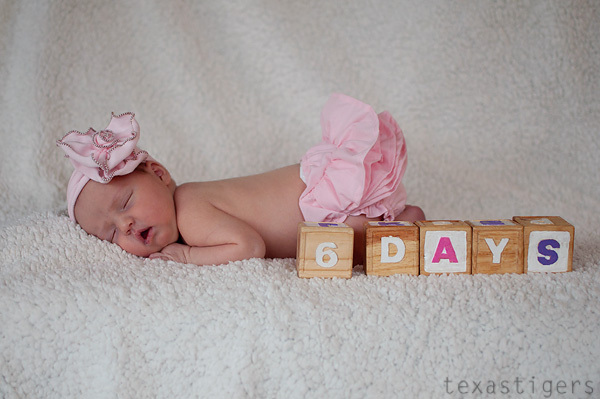 Time has just flown by and she's not an itty bitty newborn anymore. She's still little of course but just not as little. 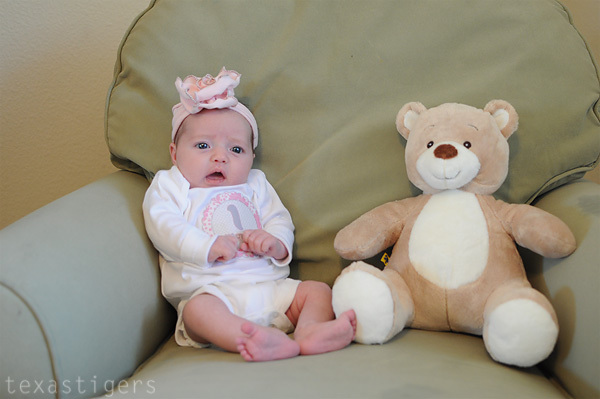 I realized last week that we hadn't made her a bear like we had for Abby and Micah so we fixed that this morning and took her one month pictures. Micah enjoyed helping us build her bear and was a very sweet big brother about it! Micah and Abby are still in love with their little sister. When she's crying they'll tell me that she's hungry and both still love to get a chance to hold her. Micah has a little jealousy when he's tired, especially in the evenings since Alexis likes to cluster feed and has been a little more needy during bedtime which is when I usually rock him as well. I've managed to rock both at the same time. Micah wasn't thrilled with that solution but it got the job done. 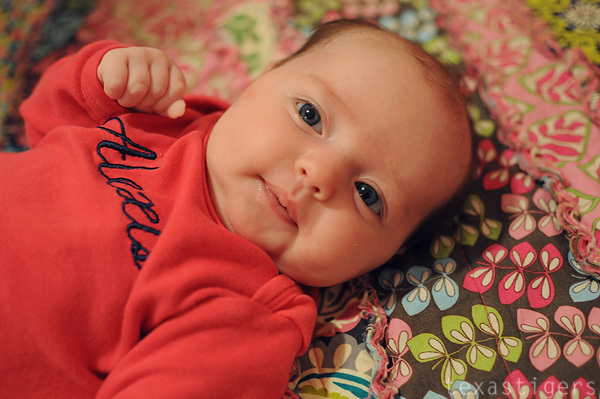 Nights that Beau is home during the evening Alexis will hang out with Daddy and take a bottle of pumped milk (yay!) while I have some time to rock Micah. 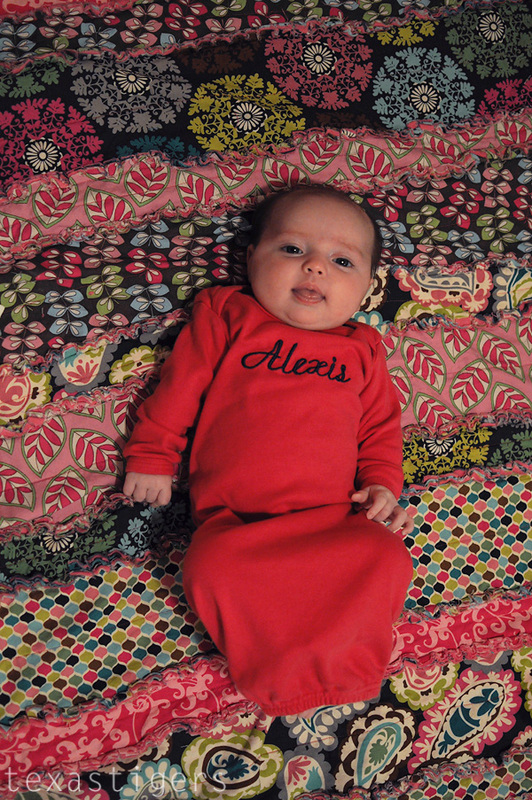 Alexis is still a pretty easy going baby. 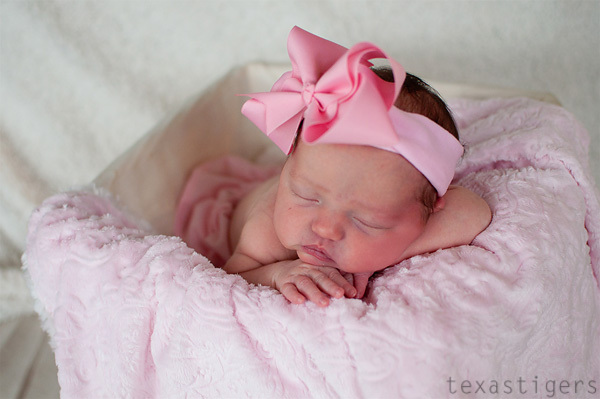 The past few days she's stated to have much more awake time and is coming out of that super sleepy newborn phase. 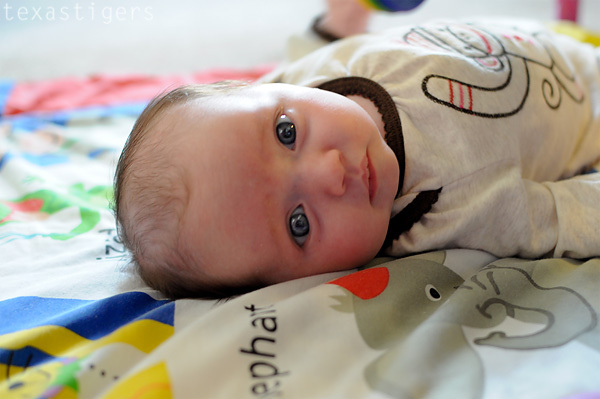 She likes to lay on her playmat for short periods of time and really seems to enjoy watching Abby and Micah. This morning Micah was sitting next to her while she was in the bouncy seat and she was giving him some serious smiles! Yesterday afternoon and evening she wanted to eat and eat and didn't want to sleep past a cat nap. I think we might have had a little growth spurt. I was worried how the night would go as she didn't want to be put down and was eating more often than normal but all the eating and not sleeping wore her out and she gave me the best night of sleep yet! I hate to jinx it by saying that though! Diaper: size 1, we moved up about a week ago when we ran out of nb sized diapers. Nursing - anywhere from every hour (in the evening cluster feeding) but mostly 3-4 hour stretches. 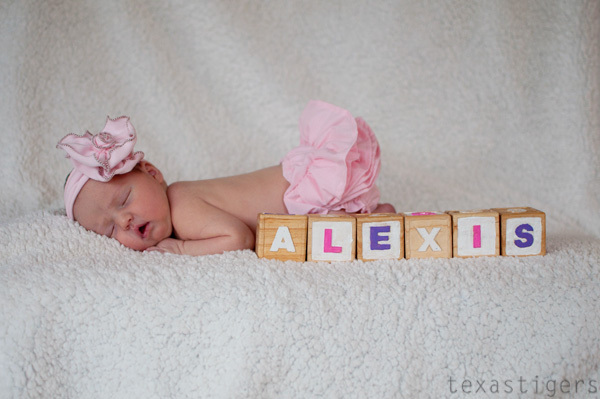 Here are some more of Alexis's newborn pictures..... enjoy!